Coates (DE-685) was launched 12 December 1943 by Bethlehem Steel Co. Quincy Mass. ; sponsored by Mrs. A. M. Bledsoe wife of Captain Bledsoe; commissioned 24 January 1944 Lieutenant W. S. Wills USNR in command; and reported to the Atlantic Fleet. Coates served as a schoolship for student officers and nucleus crews at Miami between 8 April 1944 and 15 September 1945 when she reported at Charleston for inactivation. Coates was placed out of commission in reserve 16 April 1946 at Green Cove Springs. Coates was recommissioned 7 February 1951 and reported to her homeport Norfolk 18 March. After coastwise operations and training she sailed 9 July from Norfolk to Liverpool Nova Scotia on hunter-killer exercises returning 27 July. Training in Cuban waters and local operations preceded assignment as training ship for Fleet Sonar School Key West in the spring of 1952. Coates sailed 26 August 1952 to join in North Atlantic Treaty Organization Operation "Mainbrace" visiting the Firths of Clyde and Forth and Arendal Norway before returning home 11 October. 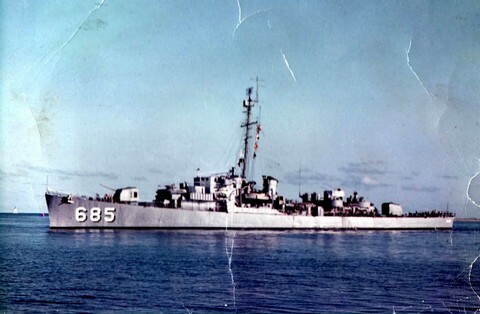 Coates resumed local operations training exercises off the Virginia Capes and at Guantanamo Bay Cuba and took part in a midshipman cruise to Brazil in summer 1953. NATO exercises took her to Scotland and France from 12 July to 3 September 1954. She served as schoolship at Key West early in 1957 and on 21 November 1957 was assigned to the 3d Naval District as a Naval Reserve Training vessel operating from New York City. Through 1963 Coates has conducted training cruises of various lenghts in Long Island Sound and to ports in the West Indies and along the east coast. Her base was changed from N.Y. to New Haven 19 September 1960.